Life sometimes brings a setback so unexpected or powerful that we feel confused, disoriented, and lost. We feel overwhelmed by doubt or fear, and lose confidence and faith in our abilities, our judgment, and our basic goodness. This wise book is designed to help readers recover self-confidence and move forward with life, filled with renewed hope and purpose. Daniel Grippo is the editor of CareNotes, a division of Abbey Press publications. He is the author of several Abbey Press books, including Loneliness Therapy and Healing Thoughts for Hurting Hearts (August 2004). His wish for the world: that adults would work less, play more, share their toys, and learn how to get along. 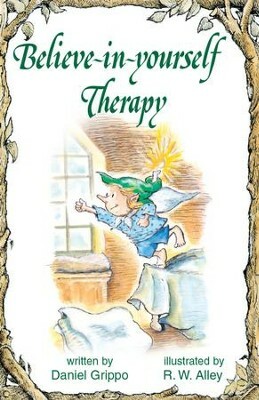 R. W. Alley is the illustrator for the popular Abbey Press adult series of Elf-help books, as well as an illustrator and writer of childrens books. He lives in Barrington, Rhode Island, with his wife, daughter, and son. See a wide variety of his works at: www.rwalley.com. I'm the author/artist and I want to review Believe-in-yourself Therapy / Digital original - eBook.